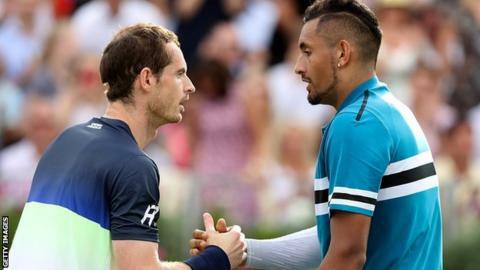 Australian Nick Kyrgios says he wants to emulate his good friend Andy Murray by winning the Queen's title as he targets grass-court success this year. Kyrgios, 23, won his first ATP title in 14 months last week, beating three top-10 players - including Rafael Nadal - on way to victory at the Mexican Open. The world number 33 has confirmed he will return to Queen's in June. "The courts are perfect, they suit my game and if I go well it will set me up perfectly for Wimbledon," he said. The Fever-Tree Championships take place between 17-23 June, with BBC Sport providing live coverage from the west London club across television, radio and online. British number one Kyle Edmund, 24, is also set to play at the ATP 500 event, along with 20-year-old Greek star Stefanos Tsitsipas - who has climbed into the world's top 10 for the first time - and Croatia's defending champion Marin Cilic. 'I know what I can do if I'm feeling good, and I want to show that on the grass at Queen's and Wimbledon this year," Kyrgios added. "The Fever-Tree Championships is a great event, one of my good mates Andy Murray won the title five times there, so that shows how important it is." Murray, 31, won the title in 2009, 2011, 2013, 2015 and 2016.